When Rolex came out with the GMT-Master in 1955, the legendary watch brand proved, yet again, that their watch innovation is second to none. This unique model featured a revolutionary function: a design that would allow the wearer to read the time in multiple time zones simultaneously. The original GMT-Master was designed in collaboration with Pan Am Airways, the leading American airline at the time, to allow Pan Am crews to easily tell the time during long distance flights. The GMT-Master introduced a one-of-a-kind feature: a third hand that completed a full rotation every 24 hours. This third hand could be set to Greenwich Mean Time (or GMT) or any other time zone, which allowed the wearer to use it in conjunction with a unique bezel to tell time in all 38 time zones at once. The GMT-Master got a major function update in 1983. This new model, which would be referred to as the GMT-Master II, featured a new movement that allowed the hours hand to be set independently from the watch’s other hands, which dramatically increased its ease of use. Today, the GMT-Master II is widely celebrated among world travelers and horology enthusiasts alike. It’s innovative function, incredible reliability, and attractive design has made it a legendary watch. It’s at once practical, stylish, and collectable, which has led to it being one of the most highly desired watches across the 20th and 21st centuries. The classic “Pepsi” GMT-Master, which features the model’s original bezel coloring. Over the years, the GMT-Master II has had a number of iconic bezel designs, which all come with unique nicknames (given by fans, not Rolex them self). 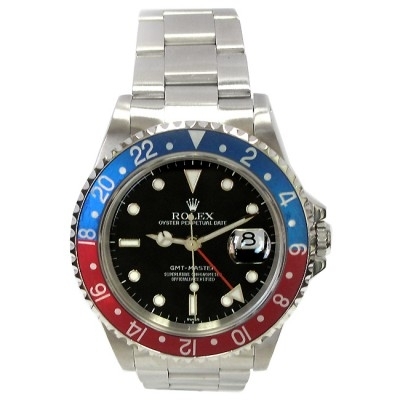 Their “Pepsi” bezel, which gets its nickname from its red and blue coloring, is perhaps the most notable. 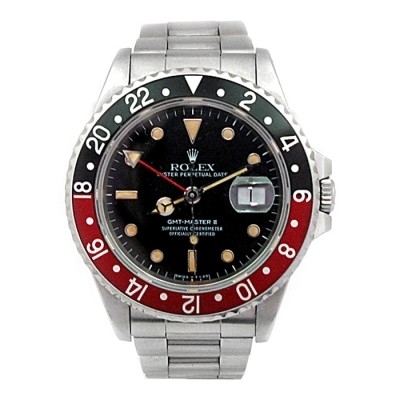 This bezel was the original color combination when the GMT-Master debuted in 1955. The black and blue “Batman” version of the GMT-Master II. 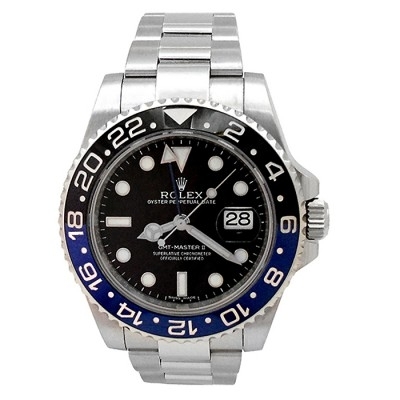 The “Batman” version of the Rolex GMT-Master II, which was first released in 2013, features a dark and elegant black and blue dial. The famous “Coca-Cola” version of the GMT-Master II. This GMT-Master II model, originally released in 1982 has earned the nickname “Coca-Cola,” thanks to its red and back bezel. 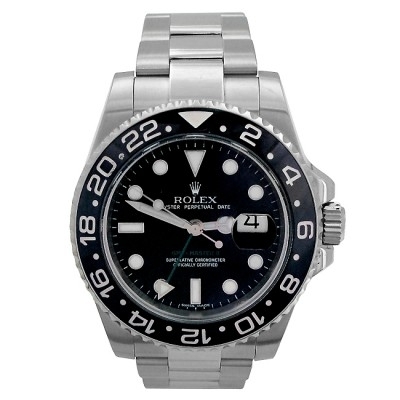 A Rolex GMT-Master II with a black bezel and black dial. While it’s without a fan nickname, the all-black version of the Rolex GMT-Master II has become a popular model, thanks to its simple and sleek look.